We are Lori and Erin – best friends. We have been documenting wedding days together since 2009. So when your guests go quiet right before you walk down the aisle, we know where the other person is, and exactly what they are thinking so we can move silently to perfectly capture the moment. A wedding day is a beautiful combination of romance and story. It's the dreamy, love filled looks between the two of you, as well as the beauty happening in every quickly passing moment. Using our combined photography styles, your wedding images will depict both. We blend together perfectly to give you the best of both romantic and real documentary wedding photography. We push each other to be better, not only as photographers, but as people as well. We work together to be more creative, and keep each other motivated every day. And at each and every wedding we work hard to capture every person, moment and detail of your wedding for you. When it comes down to it, we get to spend our weekends with our best friend. Add to that, we get to be a part of the happiest day of your lives, on a regular basis. We are surrounded by a couple in love and the most important people in their lives, who welcome us into the family with open arms. It is an amazing feeling, and we are honored to share it with you. Erin’s creative history began because of her family. Her eventual degree in Digital Media & Fine Arts from Canisius College helped as well. She loves engagement sessions because of their calm, relaxed pace that allows real connections to shine. At a wedding she also loves candid images, but truly excels at creating a moment that can only exist between two people. She loves "love" and believes that family is everything. This is also why she enjoys weddings, because it is once in a lifetime moment when all of your people are together. She enjoys adventures, but is most comfortable at home with family (husband, Matt and son, Lucas), friends, a book, and a cup of coffee. The daughter of filmmakers, Lori may have been predestined for a life in the creative world. She met her husband, John, while studying photography at RIT. On a wedding day, she loves seeking out the most candid moments, which can be found everywhere. She thrives on documentary photography, and is always watching for laughter and connection. While candid moments draw her in, she can also create something spectacular with just one light and a couple in love. When not creating heirlooms for her friends, family, and clients, she can usually be found in the woods or on a yoga mat. Either way, her dogs Molley and Mouse are never far away. We prefer flip flops to shoes. We love our dogs like children. We believe in the power of hugs, and that laughter is the best medicine. We believe in love and family - from those that came before us, to all those that will follow after us. We are who we are because of them. We both believe in something bigger than ourselves, and so we believe in carrying on a legacy. Because of all of this, we believe in not only our relationship, but all relationships. We are truly thankful for the lives we lead. To us, what we do goes so much further than just pushing a button on a camera. We're privileged to have careers that allow us to celebrate love and life on a daily basis. So we give back whenever we can. 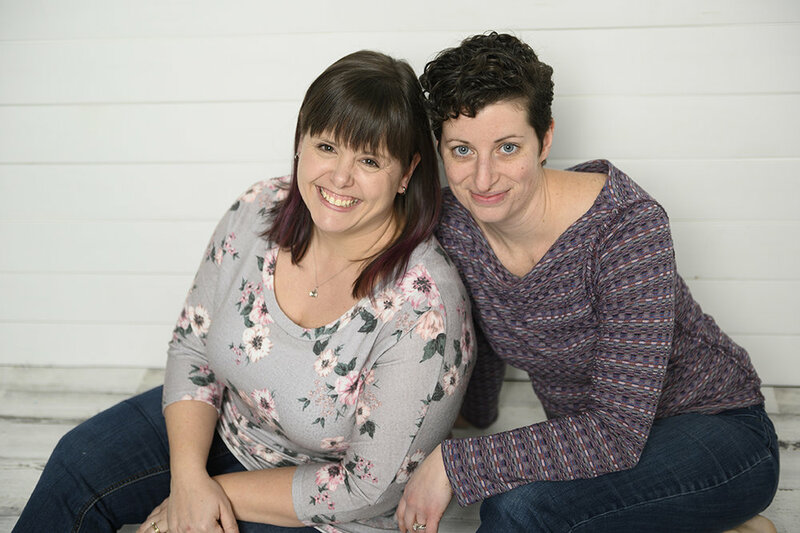 Both Erin and Lori are also past presidents of Greater Rochester Professional Photographers.